How many of you keep hearing how difficult it is to document one’s ancestry through the female side of your family. Reason often given is because each time a female marry, she gives up her birth surname and takes on her husband’s surname. Well, while this is true in some cases, it also creates a great opportunity for some interesting genealogical research. 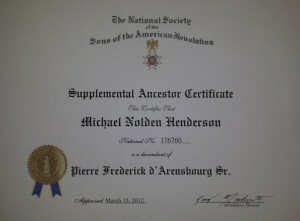 Family Tree connection Mathieu surname and Darensbourg all the way back to Lemoyne family in Montreal Quebec Canada 1657. 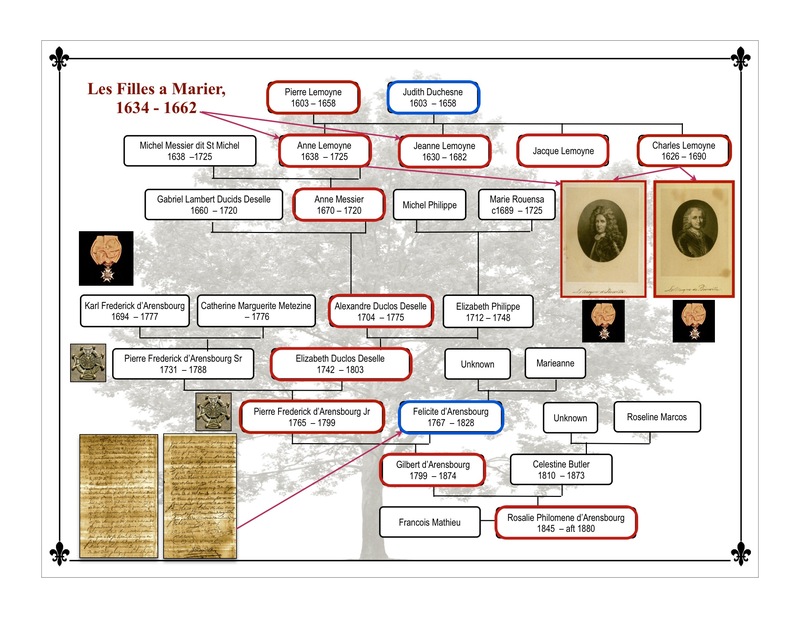 Here is what happened, when I went looking through my mother’s ancestry, through several family surnames such as Philips, Mathieu (a critical family surname – Mathieu documented and recently published in my Memoir – GOT PROOF!) D’arensbourg, Duclos-Deselle, Messier and Lemoyne. 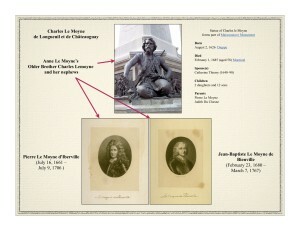 What I discovered was our family’s French female progenitor back to 1657 in the Lemoyne family line. And guess what, It’s now documented through two lineage Societies. 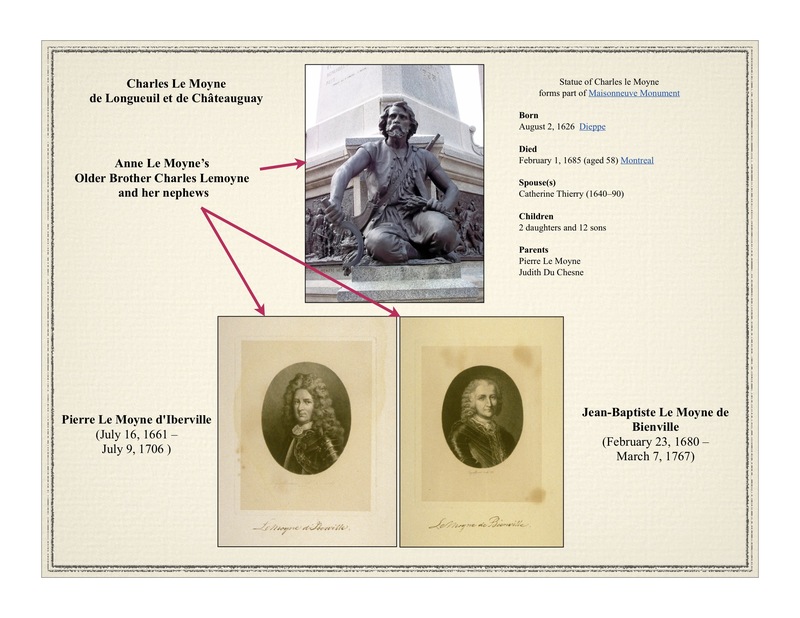 See more in recent blog post titled : French Female Ancestor Documented Back to 1657 Links New Orleans Native to Founders and Settlers of Quebec, Canada. 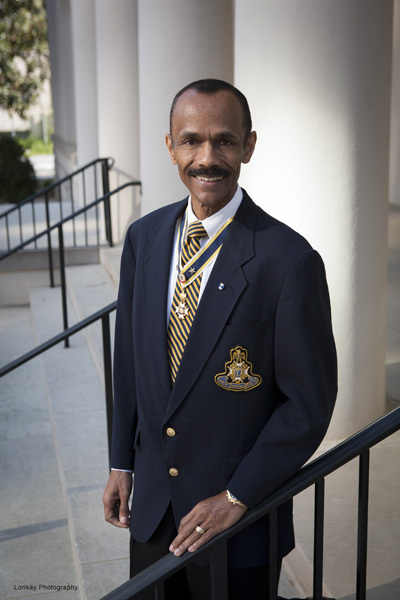 It is my sincere hope that each of you on a similar journey are continued to be inspired by stories such as this one and know that anything is possible as long as you believe and not give up the search. I did not and hope you to won’t either. 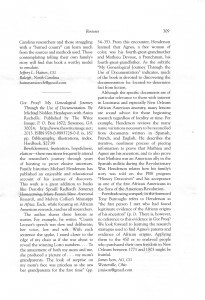 National Genealogical Society Quarterly Reviews GOT PROOF! What a pleasant surprise to learn that a review of my recently published memoir, GOT PROOF! 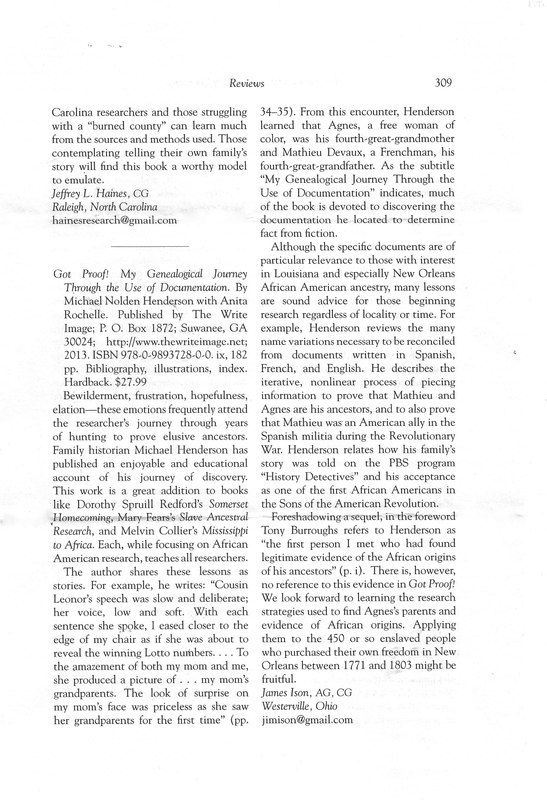 My Genealogical Journey Through the Use of Document (The Write Image 2013) was published in the December 2014 issue of National Genealogical Society Quarterly. 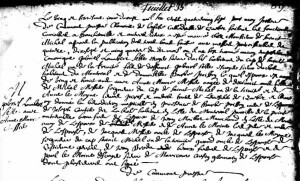 The NGSQ reviewer captures what many genealogist and family historians all go through during their research. Several months ago, I shared in a previous blog post titled Finding Ancestral Proof on Paper and in Stone how in 2007, I visited Montreal, Canada and found the city charming. In one particular area, called the Place d’Armes (parade ground), which dates back to the 17th century, stands a monument dedicated to five of the early settlers of Montreal who arrived in 1642. See more here. 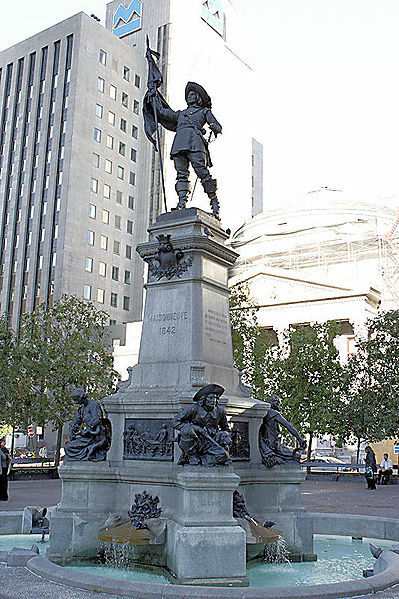 The monuments in both Montreal and one New Orleans depict several French and French Canadians who were credited with settling New France, which covered a larger part of northeastern Canada and would be later include an area known as French Louisiana. This might appear to be an unlikely ancestral connection for me, a native New Orleanian; however, this is where, the research of my ancestral lineage gets interesting. Using a number of colonial documents such as baptism, marriage and death records found in the Archives in Ottawa Canada, Illinois and in Louisiana and also a few published biographies, I have identified my 9th generation great-grandmother, Anne Lemoyne. 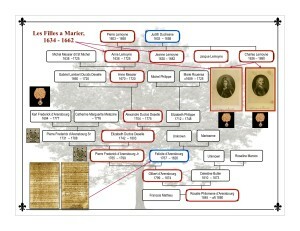 Her marriage to Michel Messier dit St Michel in 1658 connects me to Canada’s early founders pictured above. Between 1634 and 1662, 262 filles à marier or “marriageable girls” emigrated to New France, representing one quarter of all the single girls arriving in New France through 1673. They were recruited and chaperoned by religious groups or individuals who had to assure and account for their good conduct. 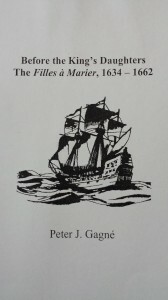 In general, they were poor, although there were some members of the petty nobility among their ranks, according to Peter Gagné author of “Before the Kings Daughters, Filles a Marier, 1634 – 1662. Michel Messier was born on July 11, 1640 at St. Denis, Rouen, Normandy, France, the son of David Messier and Marguerite Bar. He and Anne had twelve children before her death on July 15, 1725 at Vercheres, Varennes, Quebec. Michel died on November 3, 1725. To view property granted to Michel Messier dit St Michel see here. Catherine Messier was born on July 11, 1659 in Montreal and died on March 15, 1703 in Vercheres. 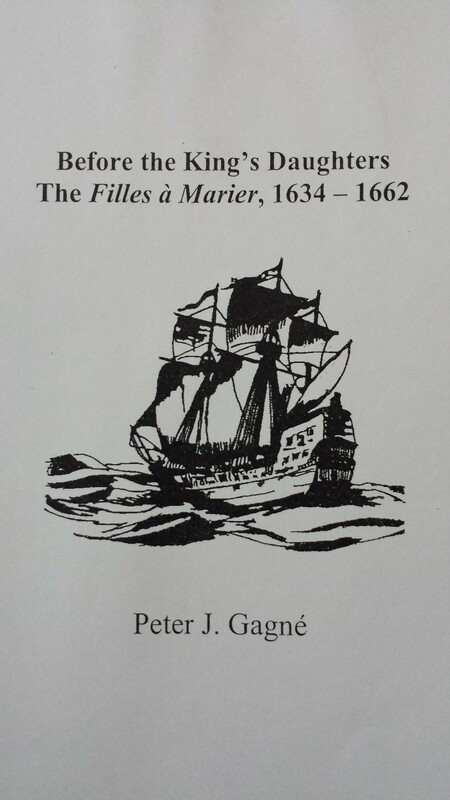 She married Etienne Gentes on November 28, 1678 in Montreal. She had at least three daughters. 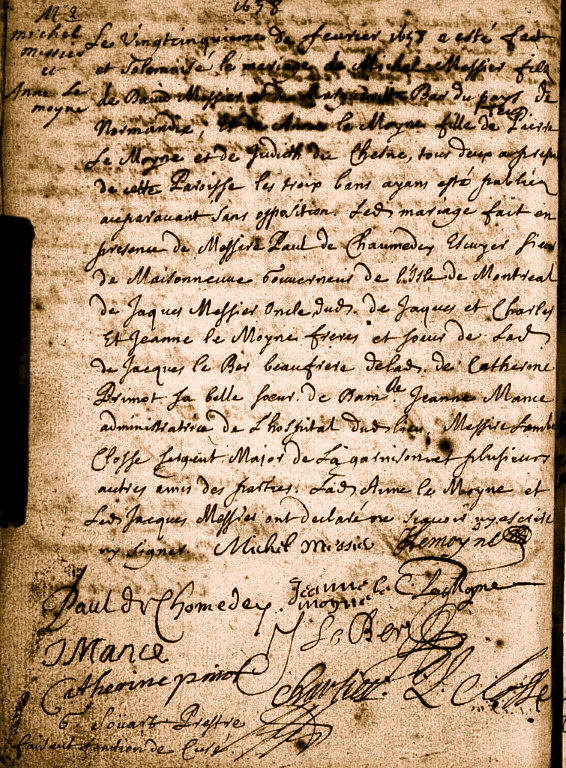 Jeanne Messier was born on June 18, 1661 in Montreal She married Ignace Hebert on January 31, 1679 and had a daughter Marguerite. She died on August 6, 1699 in Varennes. Marie-Anne Messier was born on August 2, 1665 in Montreal. She married Jean Brodeur on January 31 1679 in Boucherville. The couple had six children. Following the death of her husband, she married Alexandre Petit on January 8, 1721 in Varennes. She died in December 13, 1751 in Varennes. 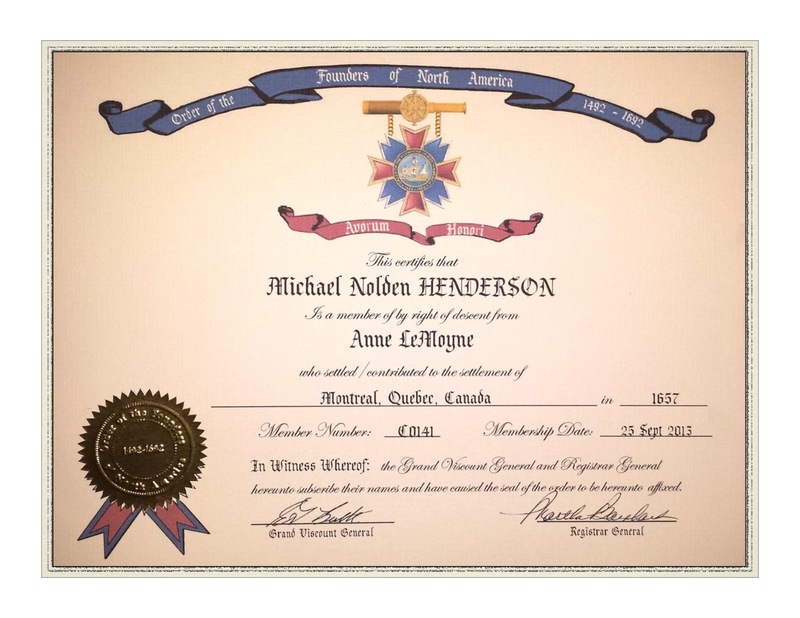 Anne was born on November 12, 1667 in Montreal. She died on January 1, 1668 in Montreal. 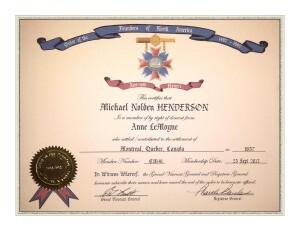 Anne was born on December 21, 1668 in Montreal. She died on January 29, 1669 in Montreal. Anne Messier was born on February 5, 1670 in Montreal. She married Gabriel Lambert Duclos Deselle on August 26, 1687 in Boucherville. The couple had thirteen children. She died on March 15, 1720 in Sainte-Anne-de-Varennes, Vercheres Quebec Canada, (Cap Saint-Michel) (ile Sainte Therese). Gabrielle Messier was born on May 2, 1672 in Montreal. She died on Jun 5, 1682 in Boucherville then ten years old. Jean-Michel was born on 31 May 1674 in Boucherville. He died en-route to Fort Louis de la Mobile in the Month of April 1705. Marguerite Messier was born on May 24, 1676 in Montreal. 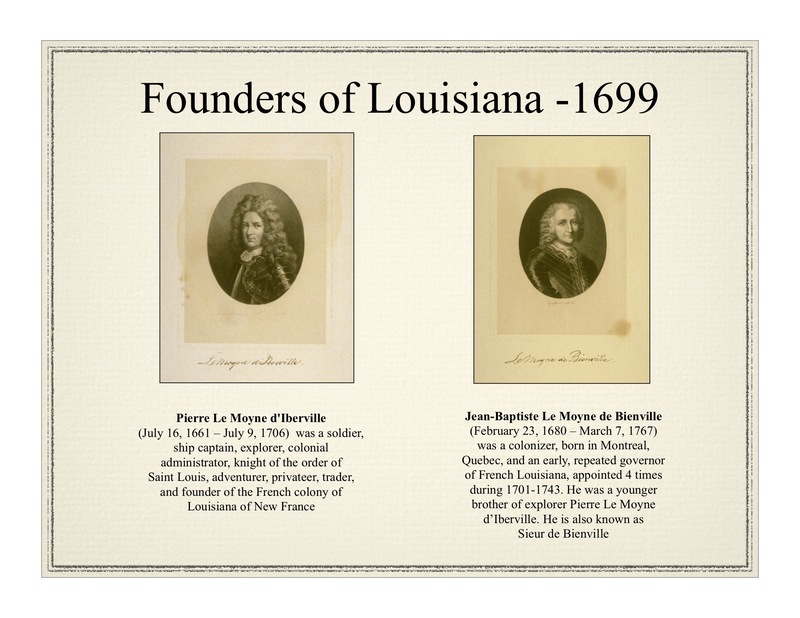 She married Pierre-Charles LESUEUR on March 29, 1690 in Bourcherville. She had five children. 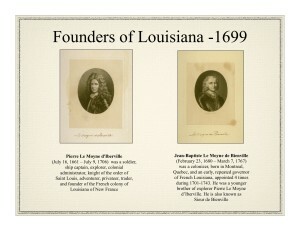 She died on March 5, 1741 at Fort Louis de la Mobile, Louisiana. 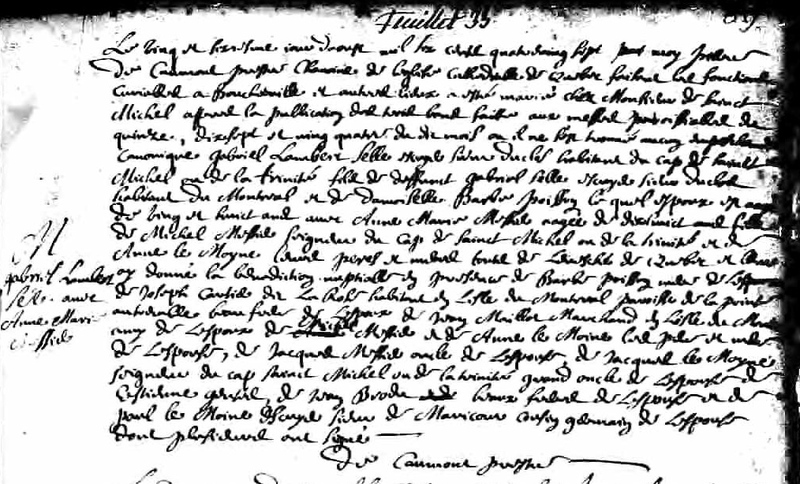 An unnamed child was born on August 20, 1678 in Montreal. 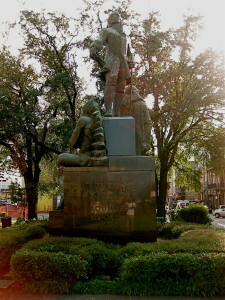 His burial took place on August 22, 1678 in Montreal. Francois-Michel Messier was born on 1679 probably in Varennes. He first married Marie-Anne Amyot on February 10, 1706 in Varennes. From this marriage, six children were born including four boys. He married his second wife Marie-Jeanne Duval on October 8, 1725 in Contrecoeur. Again he became a widower. He married his third wife Madeleine Lefabvre on Jul 25, 1729 in St. Francois-du-lac. And finally, he married Angélique Poirier on Jun 8, 1744 in St. Anne-du-Bout-de-Ile. He died on Jun 11 1751 in Varennes. 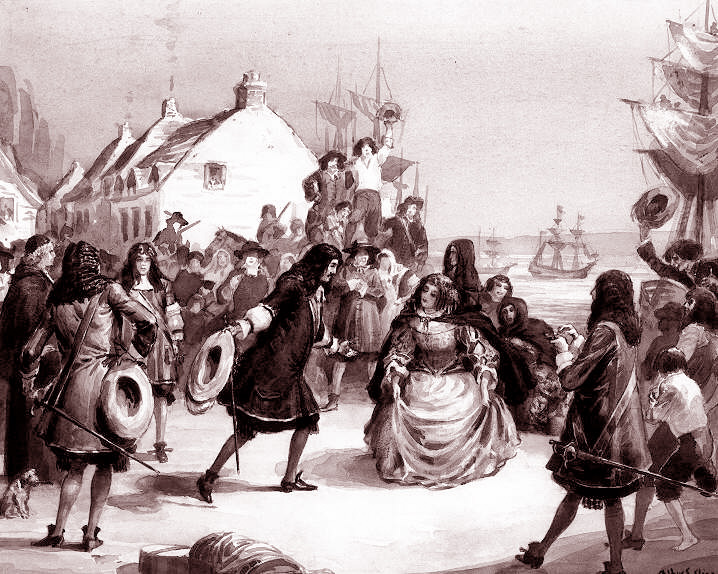 Rene Messier was born on April 20, 1681 in Varennes. His birth is recorded in Boucherville. 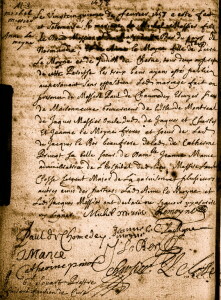 On January 18, 1706 in Varennes, he married on August 25, 1718 in Batiscan, Madeleline Guillet with whom he had eight children. It is in Varennes on May 22, 1758 that Rene died. 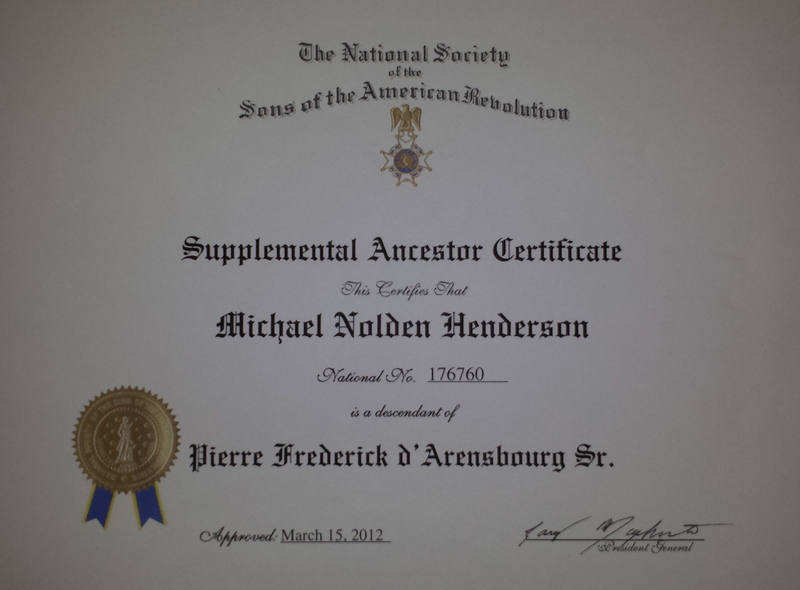 Family Tree traced back to several Founders and Early Settlers of Quebec Canada (New France -1642) and Louisiana 1699.